Every actress who has ever played this role has indelibly made it her own. It is the only way. Maria Callas was one of a kind. In the Garry Marshall Theatre‘s inaugural production, Master Class, Carolyn Hennesy is superlative as renowned opera icon Maria Callas. There is no way to pretend your way through playwright, Terrance McNally’s fourth-wall breaking, glamorous, larger-than-life pedagogue, holding a voice master class at the Juilliard School where details are essential, nonsense intolerable and the music is God. Where Callas would say, ‘It has to be lived’, Hennesy lives Callas body and soul. 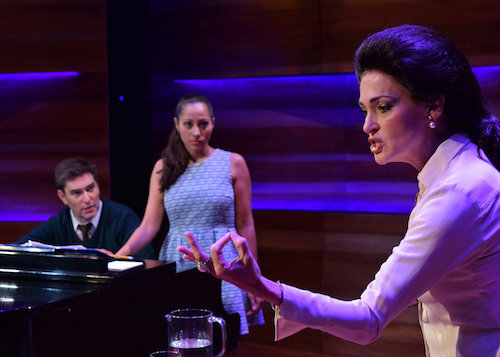 It’s an exquisitely nuanced performance where every emotional accent of Callas’ most consummate moments are delivered from inside the memories of herself – the fat, ugly girl with acne, having to take second to the pretty blonde who gets the coveted role in conservatory, the abuse from Ari Onassis and the desperation for his love, the hatred of her enemies, and the triumphs at La Scala where she sings to shock and awe heights not heard. All of the drive, the will to be great, the struggle for relevance, the exultation of being crowned La Divina, so strongly insufflates the drawn focus during the arias sung by the students, that created within our own minds are highly colorful pictorials. We connect – exactly in the moment with her. Hennesy’s comedy is delightful. Much more biting than when most memorably the role was originated by Australian actress Zoe Caldwell on Broadway in 1995 (although originally was staged by the Philadelphia Theatre Company in March 1995, the Mark Taper Forum and the Kennedy Center), but equally and powerfully effective. In fact, Hennesy’s most caustic moments are the funniest. Endearingly so. All of the acerbity and the arrogance is merely a cover for this heartbroken icon who has ruined her voice, can no longer sing, yet still lives passionately through the art for which she has made great life sacrifices. Callas’ commentary with all three of the students (victims) is harsh and often cruel. But there is more than an underlying truth-to-power in her words. Each singer reluctantly and even resentfully rises to a newer level of mastery. Occasionally the direction is awkward. Characters are seemingly hidden in corners. And the flourish of a younger Callas at La Scala, above the stage during the first aria, is mostly unnecessary. La Divina in the present moment is the star. There is no compelling reason to look elsewhere. The cast is lovely. There are breath-stopping moments when the music by Giuseppe Verdi, Giacomo Puccini, and Vincenzo Bellini are vocalized in such splendid form in turn by Maegan McConnell (Sophie de Palma/First Soprano), Landon Shaw II (Anthony Candolino/Tenor), and Aubrey Trujillo-Scarr (Sharon Graham/Second Soprano). Each singer is a buttress to Callas as much as being a thorn to her heightened, rose-colored spotlight she insists they reside, although to her estimation will never reach. That also includes piano accompanist Manny (Roy Abramsohn) with whom Callas at one turn derides and at another finds solace. Jeff Campanella (Stagehand) is appropriately unrepentant in his downright churlishness of the diva and anything at all happening on the stage. Master Class starring Carolyn Hennesy is gorgeous and sentient in such a way that connects you in the room, not merely to watch. You are ‘living’ the life of the diva and all of her terrible splendor in the here and now. Photo (above) by Chelsea Sutton: Carolyn Hennesy (Maria Callas) and Roy Abramsohn (Manny).